Less Effort: Unique total system design requires 20% less force to cut. Clean Cuts: Unique blade serrations spread cutting force across the blade, improving cut quality and tool life. Ultra-Tough: Industry leading pivot design leads to longer overall snip life. Precision and Control: Integrated stops make sure the blades open all the way, every time, for maximum length of cut. Comfort and Ease: Handle design and compound-leverage mechanism make cutting easier and reduce hand fatigue. Cuts low carbon rolled steel up to 18 gauge. Meets or Exceeds applicable ASME performance requirements. The M1X Wiss 9 3/4'' Aviation Snips, Left Cut is one of thousands of quality tooling products available from MRO Tools. 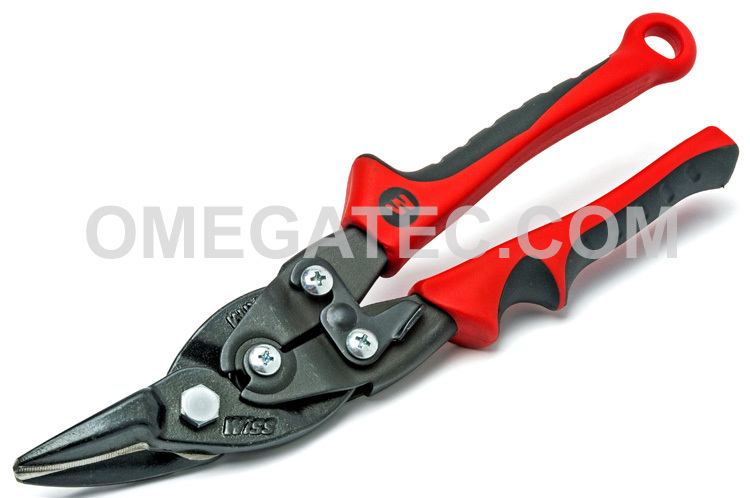 Please browse Wiss Aviation Snips for tools similar to the M1X Wiss 9 3/4'' Aviation Snips, Left Cut. M1X Wiss 9 3/4'' Aviation Snips, Left Cut description summary: Wiss 9 3/4'' aviation snips, left cut. Overall Length: 9 3/4'' Blade Length: 1 1/4'' Cutting Capacity: 18 Gauge Low Carbon Steel Direction or Type of Cut: Straight, Left Handle Color: Red Quantity discounts may be available for the M1X Wiss 9 3/4'' Aviation Snips, Left Cut. Please contact MRO Tools for details.